Stick your nose in the box and it smells like a bakery in the morning. Mini Swirlz Cinnamon Bun cereal was a big favorite around the office. There were several new cereals in our cupboard and this was the one that most people went back to the most. It's a tasty cinnamon cereal. The cute cinnamon roll shaped nuggets absorb milk in just the right way. You get a nice little crunch and because the nuggets have depth to their ridges, the milk partners with the cereal... slightly reminiscent of porous Cap'n Crunch nuggets. This cereal is a keeper. So many of the cereals we review are variations on existing products. This one has originality. You can imagine future renditions of Mini Swirls: Frosted Mini Swirlz, Maple Pecan Mini Swirlz... A truly new cereal is rarity. The only negative to report is that this cereal isn't very good eaten dry out of the box. It needs the milk to come alive. But that won't stop us from giving this cereal a perfect score. What do you think of Mini Swirlz Cinnamon Bun Cereal? It was amazing. Unfortunately, I haven't seen it for a long time. Help... Where can I buy it in Holland? I can only rate according to me simply LOVING cinnamon. Tremendously tasty... one of the best cereals ever made. Yep, this stuff is back as Cinnabon cereal! Tastes just how I remember it! I can't find this cereal in safeway in California... I loved this cereal as a snack n breakfast... what happened to it? I haven't been able to find it in the stores around Livonia, MI. What gives? I LOVE this cereal!! My gramcracker brought it down from NJ for me. Where can I buy this in NC? This is THE BEST cereal in the world!!!! My Grandma just brought it down from NJ and it is the new love of my life. This best cereal in the world. I'm sorry to report that this cereal has been discontinued by Kellogg's. It will be missed. 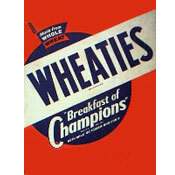 Click here for a list of Kellogg's discontinued products. Has anyone found out if this cereal has been discontinued? Can't find it in Midlothian, Virgina - where is it? Can no longer find this cereal on shelves in south eastern PA. What happened? Can't find in southwest suburbs of Chicago. Where is it? Please tell me where I can get this cereal in Orlando, Fl! Help me find this cereal in Victoria, TX!!! 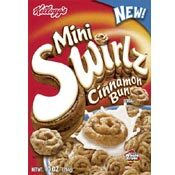 Please help me find this cereal in the Athens, Ga. area, Mini Swirlzs Cinnamon Buns. I've looked in every grocery store and can't find it anymore. Thanks! I'm having the same problem. My family loves this cereal and now we cant find it anywhere. traveled to 5 different wal-marts today and couldn't find it. looking all over the net for it and no luck.... please help. If anyone knows where to still get this please email me at JQLady@charter.net... This is the only cereal my daughter will eat and it's hard to get her to eat at all with the chemo treatments and all, and now I assume after researching and seeing all these comments I hope they did not discontinue this! please don't! This is my favorite cereal and I can't find it anywhere. What happened? Where did it go?? Please bring it back!!!!! PLEASE!!! PLEASE do not discontinue this cereal. This is the BEST cereal my son and I have EVER had and it HURTS to now go into the stores and cant find this AWESOME cereal on the shelves ANYWHERE. First the Eggo's cinnamon toast was discontinued... now this?? Please get this cereal back on the shelves for people like myself that really enjoyed this cereal enough to buy 2 to 3 boxes EVERY week. I have went to several Walmarts, Publixs, and Krogers to find it nowhere. PLEASE HELP!! I have been eating these cereals and loving them for about a year and now all of a sudden I cant find them in any grocery store. Please help. Holy moly this cereal is the BOMB!! I feel sorry for anyone who can't find this locally. I was at walmart & decided to try new cereals instead of the usual classics like trix or lucky charms. So I bought this..and I finished it in 2 days. I love cinnomin rolls in the morning but when I'm too lazy I have this...yummmmm...heaven in a bowl. Even without milk its so...heavenly..in fact I'm gonna get myself a bowl..or 3. This cereal is a must I crave this when I'm at school and tend to overeat this stuff till I puke. My mom has to hide this from me becuz I pig out on it even though we have a candy jar & oreos..this is what I crave! This is a great cereal with great potential. I expected the "swirlz" to be rough against the roof of my mouth, but the bits are perfectly comfortable. Kellogg's capitalized on a breakfast favorite, and, thank goodness, they executed perfectly. Excellent product. This cereal is AWESOME my mom brought it home from school where she works and in 5 days it was gone! We went looking for it in Stop and Shop but they didnt have it bummer. I love this cereal. If you know where they sell it please message me to isabella415martinez@gmail.com so I could go buy it... thanks. It is a very beneficial cereal if you have a sweet tooth but it tastes great with milk.... milk brings the charm out and makes it shine with cinnamon. This cereal smells really good, but I agree that it needs milk to come alive, so don't eat it out of the box or you might break a tooth. I also agree they look like little cow pies. Its stays very crunchy in milk and only has 120 calories per serving. It looks like poop. I wonder what kellogs was thinking when they made it into "swirls". "Guys, you know what would be funny? If we made a cereal that looks like cow#### and made people love it." Awesome cereal. Though personally I need to space out my bites, or the wonderful cinnamon/icing flavor starts to wear off a little, but all in all this cereal is the pinnacle of "The perfect treat". How aout a review of kellog's peanut butter mini swirlz cereal? I grabbed a box on impulse the other day, and I like it better than cap'n crunch peanut butter cereal, which I've always enjoyed immensely. This is my fav! I love it so much!!! Yum! Yum! Yum! This review is right on.